Please note that the addon is still in beta so don't expect everything to be perfect. I made Combat Metrics basically for two reasons. First to have a tool to analyse my fights in a useful and comfortable manner. The second was to provide more insightful and meaningful damage parses. 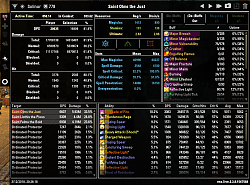 Combat Metrics is an addon to track your fights. 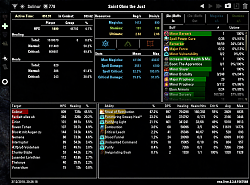 You can use it to measure your DPS, you can analyse which skills make your DPS or who caused your incoming damage. You can also analyse the heals you received or cast. 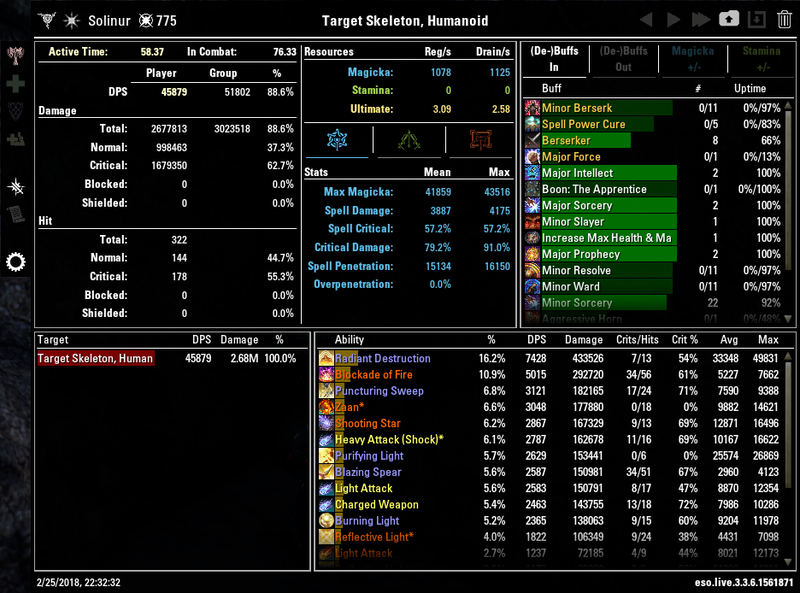 You can check which buffs and debuffs were running, how much magicka or stamina per second you used and regenerated. You can Analyse the Combat log, filter it to analyse specific issues. Combat Metrics basically just records your fight during combat and analyses it when you attempt to view the statistics. That way I hope to keep the impact on the fps as low as possible. Since it saves the data of the whole fight, you might hit the lua memory limit especially when a lot of heavy fights are happening in a row (I suspect Cyrodil is a candidate). If you want to keep the impact on memory small you can select to only keep a few fights in storage. For minimal performance impact there is a light mode that only uses a minimum of resources to show you DPS and HPS of your current fight. The main report window can be toggled by assigning a key to it or by typing /cmx into the chatbox. You can also assign keys to post the damage per second (DPS) or healing per second (HPS) of your most recent fight to the chat. Alternatively you can use /cmx dps, /cmx sdps, /cmx mdps, /cmx alldps for automatic, single-target, multi-target or single + multitarget DPS respectively. You can use /cmx hps to post you healing per second. I want to thank Atropos for letting me use his functions to build the user interface. Coolmodi's addons were also quite insightful especially for handling the event registrations. I also learned from the addons of Circonian and Spellbuilder. Finally I want to mention @EgoRush and all participants in his thread at Tamrielfoundry. The discussions there lead to my motivation for creating this addon. Sometimes a buff event is missed (probably). The addon dismisses these cases which might lead to (slightly) reduced uptimes shown in the report. If you want to see Statistics in AvA areas, disable "Light Mode in Cyrodil"
Minor Savagery is ignored since it is too spammy. Reorganized bundled libraries (Make sure to activate them in the Addon Panel). This should fix a lua error some received. Fixed an issue with the new library format introduced in last patch. Sorry for the inconvenience. Added a temporary workaround for Spell Strategist. The uptime that is shown refers to the time when at least one buff/debuff is active. 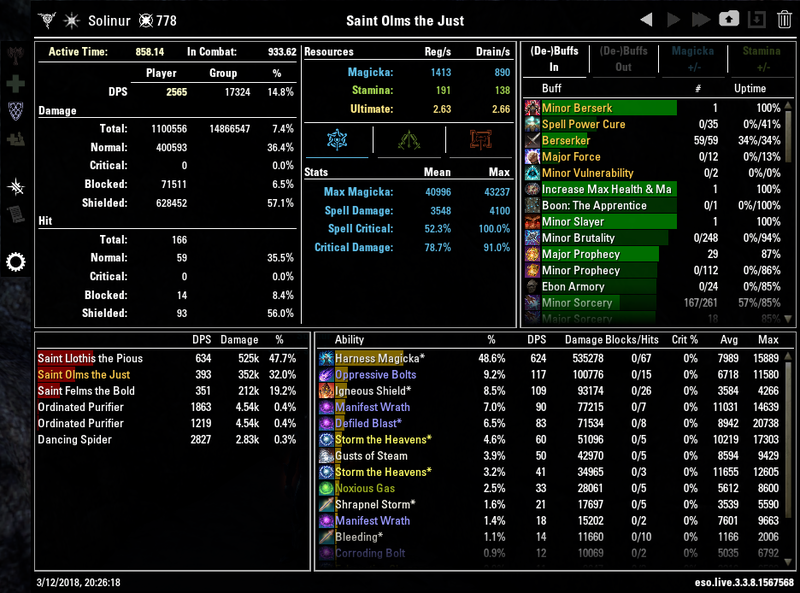 Since the buff can overlap with itself (and give twice the bonus) briefly, the theoretical possible uptime would be above 100% (for more on this see here: https://forums.elderscrollsonline.co...bug-or-feature). I still have to decide how to ultimately treat this, so this will most likely be updated in an upcoming version. Updated French localization. Thanks to @Floliroy ! Updated libraries and changed the way they are loaded. They are still embedded, but need to be activated in the addon list ingame. This requires to check the "Allow out of date add-ons" box. Improved performance for calculating fights massively. 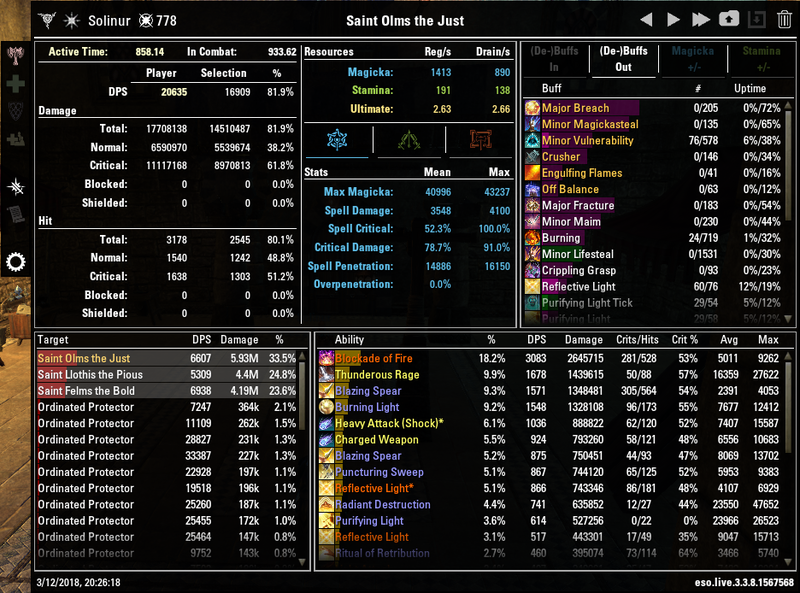 Thanks to ZOS for implementing a profiling tool with the Murkmire PTS that allowed me to identify a function where the calculation was slowed down. I wouldn't have found that without the tool. Attempted to fix an issue in Cloudrest where the fight would reset when player goes to the shadow world. While in the shadow world, Combat Metrics will ignore changes to combat status. reworked resource tracking algorithm. This means includes adding the ability to track dodge rolls and bashs. As a result now all resouce events that cannot be attributed to a source will be shown as "Unkown". Therefore resource consumption and regeneration is tracked more accurately now. Before those unattributed resource events were ignored. If you see anything suspicious there please let me know. Fixed an issue where the window position would sometimes not be saved when it was dragged around. added internal override for Line-breaker debuff, to prevent calculation issues when it gets renamed by other addons. Added tracking of Equip and Skillbars for future use. 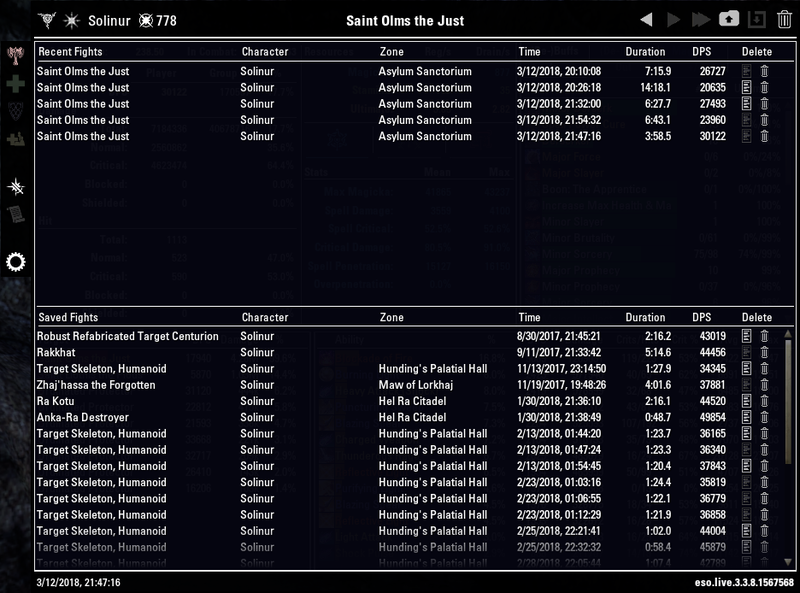 Combat Metrics can now be found on Github: https://github.com/Solinur/CombatMetrics. The UI has been completely rewritten. It still works the same for most parts, but the code behind it is cleaner and more performant. Hopefully I didn't introduce too many bugs :D.
Reworked the system how fights are stored. A seperate "Sub-Addon" (CombatMetricsFightData) is used for this, so it uses its own file in the SavedVariables folder. When saving a fight it will check if it can be safely stored. An error message will appear if there is not enough space. The new storage system is way more efficient for fights where you want to store the full combat log. Added "Spell Penetration" and "Physical Penetration" to the respective stats panels. It will update based on the targets selected in the unit panel. An entry in the settings menu allows you to change the assumed resistance of your targets and the assumed value for the Crusher debuff as it cannot be read from the API. Reworked how average values of stats are calculated. Before all damage effects would be used to weight the stats. Now magicka related stats are only weighted by magicka damage effects. "Critical Damage Done" is only weighted by crits. Buffs and Debuffs cast before the start of the fight will now be tracked. The fight label can now be edited. Just double click it! Added an option to prioritize keeping boss fights when deleting recent fights due to reaching the limit. Added an option to mark buffs/debuffs as favourite. Just right-click one in the buff panel. Favourite buffs will be shown on the top of the List. The fightlist (when you "load" a fight) shows a few more bits of information about the fight, like zone, character, time. Depending on the Selected Category, (e.g. 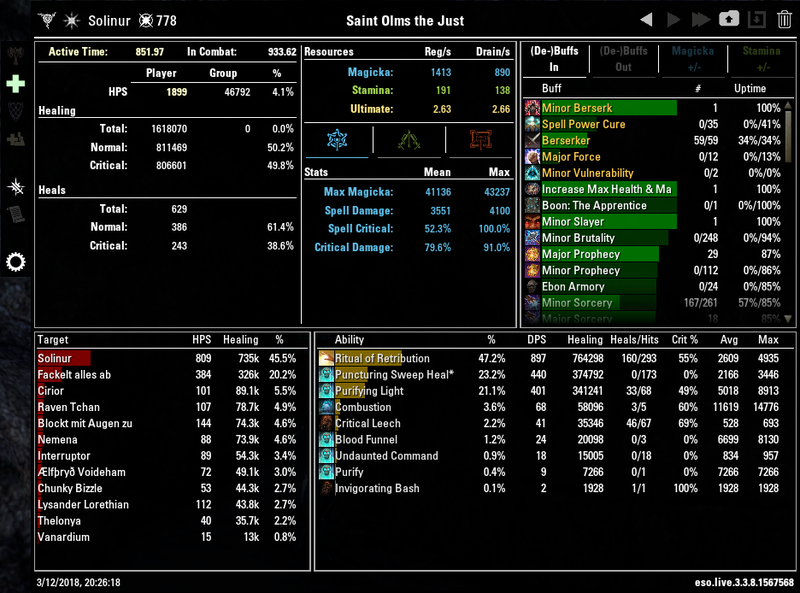 "Damage Caused", "Healing Done") DPS or HPS will be shown. Fixed an issue where the name of the fight was not set in the fightlist if the fight had not been calculated yet. Fixed an issue where nothing got shown in the combat log if a unit and a debuff were selected. Added an option to change opacity of the live report. Added an option to lock the position of the live report. Added an internal parameter called hpstime. This allows to calculate the HPS based of the time you have been healing, while DPS can be calculated based on the time you did damage (In both instances its the time that passed between your first and last damage or healing respectively). In the live report window the bigger one of the two will be shown. In the main report the active time will reflect hpstime when a healing category is selected. This should also address an issue where refreshing path would cause your dps to lower at the end of the fight despite nothing really happening anymore. Fixed an issue where group detection failed. Fixed an issue where the LiveReport window could show after the loading screen even if the option to turn Combat Metrics off in Cyrodil was active. Bugfix for an arror that prevented to open the report window on PTS. Note: I'm still working on version 0.8.0, but there may be a beta soon. Fixed some leaked global variables. Replaced workaround for Minor Magickasteal with a proper fix. This was not a bug by ZOS, but a mistake in my code. Added (most likely temporary) workaround for Minor Magickasteal. Every magicka regeneration tick that is exactly 300 is attributed to Minor Magickasteal for now. Removed a spammy debug message that got lost. Fixed a bug that caused more fights to be kept in the recent fight list than it was specified in the settings. Added a fix to combat log text when receiving damage. Fixed streaming combat log to the chat window. Added option to rename the chat tab where combat log data gets streamed to. Most of the things are still the same (just done differently in the background) so don't expect any larger changes. I will rework the UI code next. I don't plan to change much, but feel free to send me any ideas or comments regarding the interface. Posting damage to chat can now be done anytime and is no longer affected by the current calculation status of the fight. You won't accidentially post low DPS numbers anymore. Fights will no longer be calculated after the end of the fight. They now will get calculated when you attempt to view them the fight report. The progress of the calculation is now shown, so you no longer have to wonder if the addon got stuck. The calculation is now faster, and also uses a more aggresive setting that might cause minor frame drops but further increases the speed. Support for stackable buffs: Each number of stacks will show up as a separate buff. This potentially increases the number of buffs quite a bit. I have ideas how to organize stacked buffs better and will implement improvements in the future. Support for group buffs: Buff uptime is given for group and player separately. DPS or HPS in the unit window is now shown as the damage per second between the first and the last hit or heal to that unit. This means, the total DPS/HPS will not be the sum of the individual unit DPS/HPS. Fights are now saved accountwide so you can review them on any of your chars. The overview shows the Character that you played with in the fight. 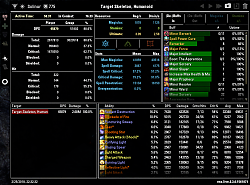 Since the introduction of group buffs tracking in Homestead, fights are quite large so only a few could be saved before reaching the file size limit (64MB). If you normally save a fight now by clicking the save button you will no longer save the combat log. This allows to save a lot more fights. If you wish to save a fight including the log, press Shift+Click. This is also explained by the tooltip. Added warning for upcoming update: At the end of this week, between May 26th and May 28th a new, almost completely rewritten update for Combat Metrics will be released. Due to changes to the data structure, it is neccessary to reset all data. Maybe make a backup or some screenshots of your favorite fights. Fixed the broken bufftracking introduced recently. Fixed a critical error introduced in last patch. Added a workaround for "better" buff tracking. It's a bit weird, but probably a bit better. You'll see. Removed tracking of effects for other units than the player. This removes debuff tracking for now. This was necessary since all debuff events are broadcasted now which lead to performance issues. Outgoing Damage that gets absorbed by a shield now contributes towards total damage. Added a check to ignore damage from "The Mage" and "The Warrior" when they blow up remaining adds on entering their enrage phase. This was setting the group damage values off. The fight will now reset when The Mage reaches the ground. You can now manually reset the fight (via Keybind or by typing "/cmx reset"). Use with caution, as it may cause issues. Attempted to fix an issue where group members were used to name the fight. Fixed a bug where player buffs were recorded twice when in group. Fixed a bug where buffs in combat log wouldn't show other targets then the player. Fixed a bug where resource and stat data were not shown in the combat log when the fight was loaded from saved fights. Fixed a bug where permanent buffs were not shown in the buff recap. Note: Combat Metrics got moved to Combat Addons since a lot of things are working quite good, I'd say. Note: Some entries in the Outgoing (De-)buffs tab are clearly not related to the player (The passive boni from repentance, Warhorn.. ). Since I have no good way to filter them without impairing functionality I'll leave it as it is. Slight change in Boss DPS post to chat format to indicate when boss dps is shown. Added two more layouts for the live report ("Horizontal" and "Vertical"), in addition to the standard one which is called "Compact". Added several debug options. Most of them should not be needed for the average player but they might help in identifying bugs/problems. Changed the way DPS is posted. There also is a new option which posts Boss DPS in bossfights and the Sum DPS in all other fights. Fixed an issue where the addon was still "stuck" in calculations for people who experienced this before the fix in version 0.5.8 and couldn't resolve it since (e.g. by resetting the SavedVariables). Added a slash command to toggle the main window. Fixed a bug that appeared when no fights had been saved and a recent fight was selected in the overview. Combat log now shows blocked and shielded hits. Attempted again to fix an issue where the addon gets "stuck" in calculations. When all data has been deleted the panel will now properly reset. You can no longer save or load fights multiple times. The save button will be greyed out for fights which are already among the saved fights, when trying to load a fight which is already loaded you will jump to the fight instead. Attempted to fix an issue where "empty" fights were being recorded. Fixed a bug where a fight would be named after a boss, when a boss was nearby but not participating in the fight. Fixed a bug introduced in the previous version. Damage and Heal done by pets is now included. The respective skills are marked as (pet) in the skill overview. Please note that the activated ability of pets is technically originating from the player and not the pet. That means only the automatic actions of the pets are registered towards them. Right now I don't plan to implement incoming damage and heal on pets, as I don't know how to show that in the interface. If you really think you need this please contact me. In order to save space you can now delete the log of saved fights, the calculated stats will still be available but of course will take up only very little space. If the lines in the combat log exceed the limit page buttons will now appear on the header bar of the combat log frame. You can use them to browse trough the complete (filtered) log. fixed an issue where the chat log tab was created even when the option was disabled. fixed an issue where the live report window was shown even when it was disabled in the options. added combat log stream to chat window. When enabled this will automatically create a chat tab and stream damage and heal events to the combat log window. You can choose to show only e.g. outgoing damage or heal according to your preference. 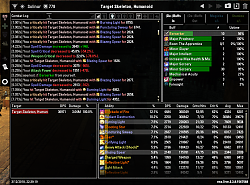 added more control bindings to selectively post only multi target or single target dps data. fixed a bug that caused wrong calculations if the report window was opened too early. This was probably the main cause for the occurrence of buffs with more than 100% uptime. increased the speed of report calculations. This is not due to an optimization, I just increased the limiter a bit, so it is now more aggressive, but still shouldn't be noticeable. If anyone notices big framerate drops just in the seconds after large fights please contact me. Added a security check to prevent corruption of the SavedVariable/CombatMetrics.lua file. This is just an estimation and should keep the file size below 55MB. If anyone sees the file getting bigger than 60MB, please contact me. @decay2, Do you think you could add a Font Setting to the config for the live report window? Would love to see the abilit to change the Font, Change the Font Size, and also change the Font settings like Outline Thick / Thin / Shadow / etc. This would make it much more readable for some of us who use this without a background. Is there a setting where I can change my preference in cmx to see only players' @ names in ESO instead of their character names? 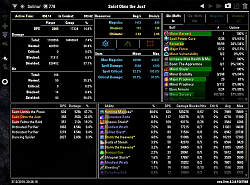 Or perhaps can this be a option down the road for the addon? I think it would be super helpful! At the moment this is not supported. I'll look into adding it in the furture. Last edited by sapphirefox : 04/17/19 at 12:42 PM. Hi I have a question about Briarheart. 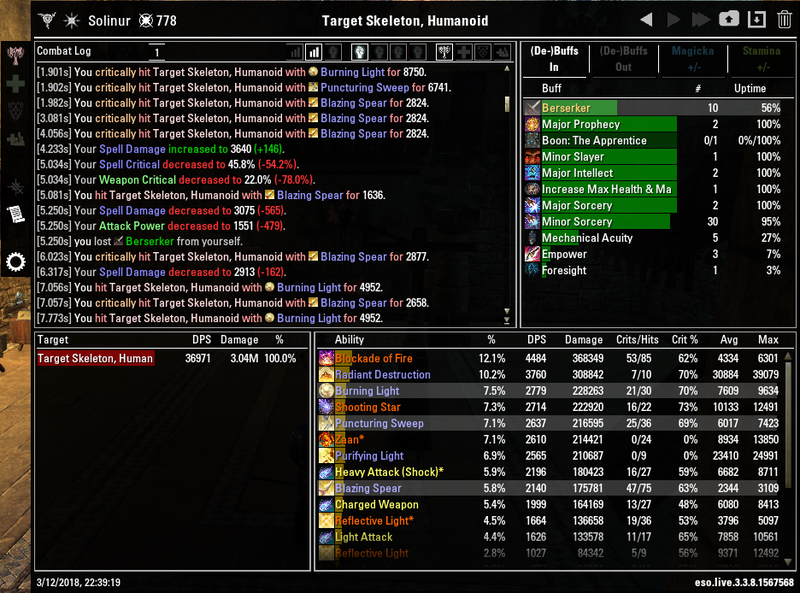 In a typical skeleton parse the "Briarheart" buff uptime is 96-98%. However according to the set description, the useful effect of increasing your weapon damage only lasts 10 seconds with a cooldown of 15 seconds. So the perfect uptime can never exceed 67%. In reality it takes a few hits after the cooldown to get that lucky 10% chance on top of weapon critical chance to restart the effect. So I would expect numbers closer to 50%. Is this something you can show in the parse? Ok scrap that. I found what is probably the issue here. I'll have it in the next beta and also in the upcoming new version. Last edited by decay2 : 04/14/19 at 03:23 PM. Last edited by SnakE : 04/07/19 at 12:56 AM. Hi. Is it possible to track the TOTAL ability DPS not only for one specific fight? I want to see the the most effective and most used abilities. At the moment there is no such function included. I also don't think I would add this soon, if at all. 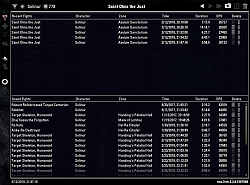 I could see this being shown in a separate addon though (done by someone else). CMX could provide the per fight data. Is there a way to disable this in Battlegrounds? Have you tried "Turn off in Cyrodil" ? Everything worked after the second reinstallation! I don't know what the mistake was. Sorry to bother you, thanks for the nice mod. I have the latest version of the game, which is on Steam. After updating the game from February 25, when I entered the game, the Combat metrics window disappeared. I tried to reinstall the mod, but it did not appear. Okay, I'll try to reinstall again. Okay, please check if the addon is enabled in the addon manager. They are included in the release but have to be enabled in the Addon panel ingame, which also requires that you enable the tickbox for "outdated" addons. Last edited by decay2 : 02/27/19 at 06:34 AM.